FCS surf products are tools of the trade for elite level Professional surfers. One of the best ways to progress your surfing is to look at what these Pros are riding and apply it to your surfing. 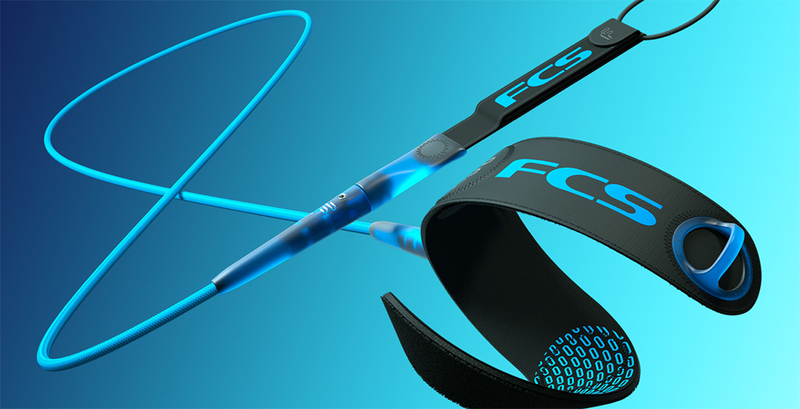 From fins and fin systems, grip, to futuristic leashes, using FCS is a proven way to get a surf advantage. Though FCS stands for Fin Control System, there’s a full suite of solutions to better your surfing. The FCS II and Traditional fin systems provide unmatched fin management. FCS leash products keep your board with you through all the waves you’ll face. Likewise there’s FCS traction to give you performance for every board you’ll surf. When you want to get around, their travel gear is renowned for its functionality and quality. Let’s look at how FCS helps your surfing. The FCS II system is amazing. FCS has taken a previous inboard plug system requiring six screws, a tool, and time, and reduced it to zero screws, no tool and it’s instantaneous to install or change your fins. So you don’t need a hex key, you don’t need to be on dry land. You can insert and remove your fins by hand, and do it in the water if you want. In this way you can instantly experiment, swapping out fins for your day to day surfing or big or small days. FCS gives you super versatility and convenience making it easy to optimise your surfing setup. The FCS II system for longboard fins is even more incredible. There’s no inboard plug needed. Their FCS II fins work in almost any longboard central fin box. There’s no hex key involved, you don’t need to be on dry land. You can insert and remove your fins instantly by hand, adjusting fin position as needed even in the water. This is an incredible ground breaking advancement so you can tune your longboarding anywhere anytime. The FCS II fin range is comprehensive with fins to match every type of wave you surf and the boards you ride. They offer you their own fin designs and those from their Team, the world’s top surfers, and world’s best shapers. FCS also provides backwards compatibility so this incredible new system can also use your old FCS traditional fins too. Rather than scrapping the original FCS plug system, that uses the hex key, FCS has refined it. It’s more robust, lightweight, and inexpensive. A huge number of board manufacturers use this ultra reliable system to provide fin management. If you’ve used a longboard with Side Bite fins, Softboard, or entry level board, you’ll know with FCS, fins can easily be replaced if damaged, removed for transport, and switched for optimal surfing and fun. Not content to just continue improving construction quality, FCS has revolutionised leash design. The key aspects of a leash are to provide security in cord strength and return spring, cuff comfort, and performance via no tangling. That’s exactly what the new FCS Freedom leash does with super style. It’s highly functional and fully minimalist so you get all the benefits without even knowing it’s there. In their core leash range FCS pioneered the use of the fin system hex key to componentise their accessories. Their leashes have their high quality components such as the cuff, swivels and cord, all integrated via the hex key connection. This is super handy as if the cord breaks or cuff wears you can easily remove them and reuse the working components as needed. So while giving you innovative new products on one side, FCS continue to upgrade the quality and longevity of the products you use day to day. Your surfboard traction preference is highly unique. To make sure you have the widest range possible to match what you want FCS bring formulas proven by numerous Team Riders each with their own design. Kolohe Andino’s grip is designed for movement, he moves his foot around, even placing it on the grip. So if you’re like Kolohe FCS has a grip to give you freedom of movement as your top priority. Jeremy Flores’ grip is designed for sensitivity. So if you’re like Jeremy you want to feel close to your board. Jeremy’s FCS grip and grooves will give you a pad as thin and responsive as possible. Filipe Toledo’s grip is about maximum traction. So if you’re like Filipe, when landing airs you want your foot to stick even if off centre. When driving, pushing hard for speed, you want maximum stick so FCS has the Toledo pad for you. Along with these elite level solutions FCS own model grip has ideal fit for your narrow, hybrid, and wide tail boards. So you get maximum traction powering your surfing. Improving on existing designs FCS addresses problems you’ve experienced in other boardbags. Their Essential Series has a unique 3D Fit solution. Its panel construction removes the seams from the rails. Then, inside the cover, dual density contoured foam runs entirely around your board. So reducing damage from this rail problem-prone area has been addressed. Not all boards are the same width and you don’t want that extra area flapping around. To keep your board cover fitting snug a stretch panel runs along the cover middle so wide and narrow boards both fit just right. This panel also provides breathability so moisture and excess heat exit, keeping your board in great condition. This cover is also light, claimed to be lightest. 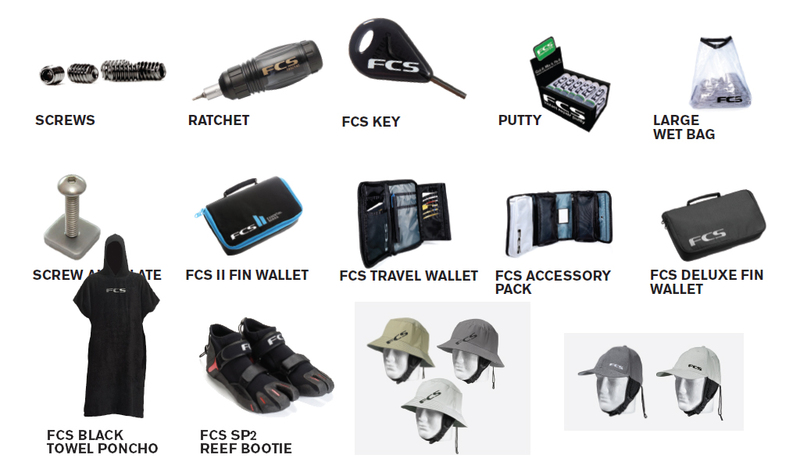 With FCS you get the most advanced products for your surfing. Join the leading Professional surfers on the World Tour, use FCS and get your surf advantage. To check all our great FCS gear and buy online click here.